When Renée Zellweger was preparing for her part in the Bridget Jones movies she did three weeks' work experience at Picador. Publicist Camilla Elworthy recalls she was so good at it there was talk of offering her a job. This article was originally published in the Guardian in 2001. Picture the scene: it's a rainy March Monday morning (bad), you're on your way to work (bad but unavoidable) and when you get to your office, you find that you are sharing it with a Hollywood actress (surreal). And she doesn't even have the good grace to conform to all the usual stereotypes: rather, she is clever, funny, down to earth, modest and effortlessly beautiful - not a scrap of make-up in sight. Yes, for the best part of three weeks, I shared my office with Renée Zellweger, working incognito for me in preparation for her role as Bridget Jones. Office life has never been so entertaining - or so weird. As the publisher of Bridget Jones's Diary, Picador was always going to be the natural nine-to-five home for Renée, who wanted to spend time familiarising herself with the publishing environment and to try out her English accent. I was approached to act as Renée's boss. "Please do give her lots of work to do. She just wants to blend into the background and it will be no different from having a work experience person around," one of the film's producers blithely told me. Yeah, right, I thought. I felt nervous about her arrival but her first words set the tone: "Gosh, you're much younger and prettier than I thought you would be!" - the first and, no doubt, the last time anyone will say that to me. She wasn't what I had anticipated - scrubbed, unaffected and dressed in neat, casual clothes, she fitted in straight away. We came up with a plan: she would be Bridget Cavendish, Bridget for obvious reasons and Cavendish as she was to be passed off as the sister of Jonathan Cavendish, a friend of one of our company chairmen. That last bit at least is true and no one was to know that Jonathan Cavendish was one of the film's producers. So she settled down to the daily round of answering the phones (and the way she says "Hello - publicity" in the film has an eerily familiar ring to it), ringing round the unsuspecting literary editors of national newspapers about various forthcoming publications, a smattering of photocopying and going through the newspapers for any book-related stories. This meant she had, more than once, to cut out incendiary tabloid stories fuming that "our Bridget" was to be played by an American. She kept her cool, but did scribble "Rubbish" in the margins of one particularly fanciful piece. No one took much notice of Bridget, the latest in a long line of work-experience people. The first glitch came on her first day proper in the office: her manager in New York sent her a lavish bouquet of long-stemmed roses, care of me, to wish her well in her new job. A nice touch, but tricky to explain away. Everyone assumed, of course, that they were for me, and as I blushingly stumbled to account for them, enquirers drifted off convinced that I either had a loaded admirer, or a few days to live, or possibly both. During one particularly persistent line of questioning, Renée just said mischievously, "Actually, Camilla's pregnant; didn't you know? ", thereby mercifully defusing the situation. She and I were also a little alarmed to see that an American student who happened to be on a week's placement with us at that time had her nose stuck in a copy of the film tie-in edition of One True Thing, which Renée had starred in. But apart from the odd sidelong glance, she didn't seem to make the connection. I had to take just one person into my confidence: a colleague in the press office whom I overheard saying on more than one occasion: "Don't you think Bridget looks just like the girl from Jerry Maguire?" I quietly explained that there was a very good reason for that and hissed at her to shutup. She hadn't for a moment thought that it was her - what on earth would she be doing photocopying in Victoria? So convincing was Renée's act that, after one meeting at which she had made some valuable contributions, our deputy publisher, Maria Rejt, no less, remarked on how impressive she was and said that we should try to find a job for her if she was serious about getting into publishing. I nodded vigorously, but said I wasn't sure what her plans were. Hmm. Renée helped me at a book launch and went unnoticed by the many journalists also there and attended a packed bookshop reading in Piccadilly, spotted only by an eagle-eyed, yet incredulous, colleague who had been off sick, who told me she had come up in the lift with Renée Zellweger; nothing slips past her. At lunchtime, Renée would be whisked away in a chauffeur-driven car with her voicecoach to a smart restaurant for a calorie-laden lunch in her De Niro-esque bid to pile on the pounds. In the meantime, I would grab a salad or a sandwich at my desk and find myself half a stone heavier when she got back, looking as sickeningly tiny as ever. We were both aspiring to the very normal weight about which Bridget Jones complains in the diary, but just approaching it from different ends of the scales. So after three weeks of helping me out, Renée swapped the life of office drudgery to return to her normal life of being a film star. When the news broke several months later that she had worked undercover at Picador, I had the wonderful task of enlightening my blissfully ignorant colleagues as to who Bridget, the rather posh-sounding and gorgeous work-experience person, really was. It was like your best ever "What I did in the school holidays to the power of 10". A Mexican wave of jaw-dropping swept through the offices. Renée sent me a thank you letter and gift after she'd gone and I have seen her a few times since then. She invited me on to the film set one day (where she performed the most wonderful and generous act that one woman can do for another: she introduced me to Colin Firth). She informed me that I had to stick around and be an extra and made sure that I was put somewhere that I would be seen, viz next to Jeffrey Archer, not a spot to which I would usually gravitate. As a result, half my head can be seen for half a nano-second in the launch party scene; not, perhaps, the full Warholian quota of fame, but my mum's quite excited. Renée also got me invited to the royal charity premiere of The Grinch, her erstwhile fiancé Jim Carrey's last film, where I sat in tiara-touching proximity to Her Majesty, and all for having graciously allowed a Hollywood superstar to do my filing. 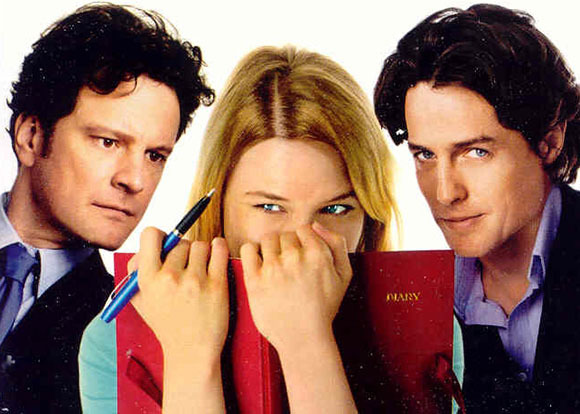 And I'm off to the premiere of Bridget Jones's Diary tonight to see the film again - and I would happily watch it another 10 times: it is fantastic and Renée's performance will put paid to any residual xenophobic quibbles people might have about an American playing that sacred role. She is brilliant. Just for the record, I would be more than happy to repeat the whole experience with any other global superstars wishing to brush up on their admin skills - an application from Russell Crowe would be particularly welcome. Helen Fielding's Bridget Jones's Diary is 20 years old this year. Read an extract here.